Comment: A heavily used, but still working copy. Coffee stain and wrinkling to the edge of the pages when a tired undergrad fell asleep and knocked their cup over on their books. The binding and pages of the book have been reinforced with tape, has tape and stickers on the cover, as well as lots of notes (some of the answers in the learning activities may be filled in) on the pages. Definitely not pretty, but it's a working copy at a great price that ships fast. ~ Book does NOT contain an access code or CD. ~ We take counterfeit textbooks seriously, and inspect our books to make sure we you get the authentic, authorized textbook you need for college! Decision making in organizations is often pictured as a coherent and rational process in which alternative interests and perspectives are considered in an orderly manner until the best choice is selected. Yet, as most experienced members of organizations will attest, real decision processes seldom fit such a description. This book brings together researchers who focus on cognitive aspects of decision processes, along with those who study organizational aspects such as conflict, incentives, power and ambiguity. These multiple perspectives are intended to further our understanding of organizational decision making. Contributors often cite specific cases, and all foundations of organizational decision making are covered in considerable detail. Decision making in organizations is often pictured as a coherent and rational process in which alternative interests and perspectives are considered in an orderly manner until the optimal alternative is selected. Yet, as many members of organization have discovered, real decision processes in organizations only seldom fit such a description. This book offers a more realistic account of decision making in organizations by highlighting several aspects such as the salience of incentives, the pervasiveness of conflict, and the role that power and politics play in organizational decision making. This book is made up of a disparate collection of essays of varying quality written on organizational decision making.I will concentrate my review on essay four ,which was written by Kunreuther and Meszaros.This essay attempts to deal with Ellsbergian ambiguity which the two coauthors call Knightian uncertainty.On page 78,footnote 5 they claim that Knight was the first to formally differentiate between uncertainty and risk in 1921.Knight provides no formal analysis of the differences between risk and uncertainty other than to state, inexactly, that under risk probabilities are measurable and under uncertainty probabilities are not measurable. J M Keynes was the first to provide a formal analysis in his A Treatise on Probability(TP) in 1921 when he defined a measure,w, on the unit interval between 0 and 1 that measured the completeness of the relevant ,potential available evidence or knowledge(versus relevant ignorance)upon which a decision maker would base his estimates of probabilities.Unless w=1,it will be impossible to specify a specific probability distribution and/or use unique,single numbers to serve as numerical estimates.If w<1,the best a decision maker can do is to use interval estimates or comparative estimates.If w=1,then Keynes's theory merges with the special subjectivist or personalist theory constructed by F P Ramsey in 1926.Let A,B and C be the arguments of Ramsey's conditional probabilities and a,b, and c the arguments of Keynes's conditional probabilities.Only in the case where w=1 will P(A/B)=C be the same as P(a/b)=c.In his 1931 review of Ramsey's works,Keynes yields to Ramsey only in the case where the probability calculus is operational.Of course,the probability calculus is only operational in the case where w=1.Only in this case will the standard addition and multiplication operations give numerical answers.The interested reader can find Keynes's analysis on p.315 and p.315,footnote 2 of his TP.Every decision theorist in the Twentieth Century has overlooked Keynes's contribution. 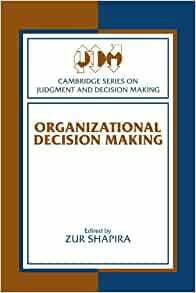 I'm a PhD student in management.This is a required book for our course "organizational decision making". It introduces readers major issues in this field and each chapter is written by leading scholars in the field, such as Shapira (also editor of the book), March, Starbuck, Salancik, etc. A perfect introductory book for those who want to learn about this field, especially for those who want to do research in this field. With the cognitive nature of the field, papers in this field might be more difficult to read than those on other topics of management or organization. Despite challenging, but interesting. I strongly recommend it. Hope you'll enjoy it.